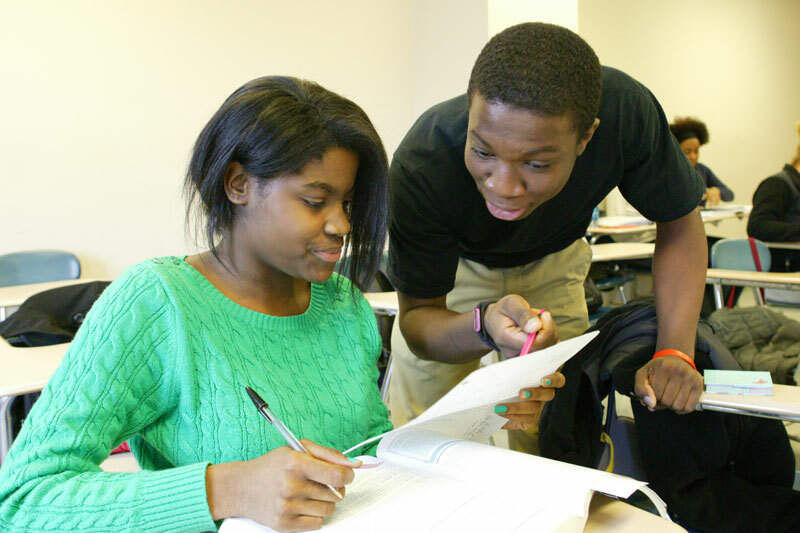 The UFT Charter School’s secondary academy, covering grades 6 to 12, has also turned a corner. More than a fifth of the academy’s seniors have already earned college credits at Kingsborough Community College — where they studied constitutional law, criminal justice and computer science — through the College Now program, and 100 percent of its first graduating class is set to graduate on time in June. While it does not yet have a School Progress Report grade, the secondary academy’s high school outpaced peer and District 19 high schools in six of nine measures of achievement included on the progress report in 2011 and in eight of 12 measures in 2012, according to UFT researchers. Complicating matters, around half of the elementary academy’s students do not continue on to the secondary academy, nearly a mile away, so the secondary academy begins with a 6th-grade class half of whom have not had the benefit of the school’s K-5 education. Yet the DOE’s progress report for the K-8 grades assesses the school as if it were one site with one administration and a stable student body. The UFT Charter School is at a crossroads: If its charter is not renewed, it will be forced to close at the end of the school year in June. The union opened the school in Bushwick, Brooklyn, to reporters in late December to let them see for themselves the progress that it has made since SUNY’s Charter Schools Institute placed it on probation in 2010 and gave it three years to address issues. Founded by the UFT in 2005, at a time when non-union privately operated charter schools were popping up across the city, the school was intended to prove that a charter school with a unionized teaching force could not only succeed but thrive, and parents and teachers say that it has. The school is divided into elementary and secondary academies on separate campuses nearly a mile apart from one another. Although they share a charter, they are distinct academies with separate administrations. Chester Campbell, the president of the elementary academy’s parent-teacher association and one of three elected parent members on the school’s board, said that he was drawn to the elementary school because it is operated by the UFT. Photo by Dave Sanders: Teacher Niambi Allen with one of her 3rd-graders. Evans-Tranumn said that when she first came onboard, she saw a lot of positive things at the elementary school, but also witnessed problems including disorganization, high teacher turnover and a lack of discipline. Photo by Dave Sanders: Teachers Maria Soehngen (left) and Katie Rust have the attention of their 1st-grade.1st-graders. “Research tells us it takes three to five years to turn schools around. It’s taken hold,” Evans-Tranumn said. The K-5 elementary academy’s scores on this year’s state English Language Arts and math exams were better than the district-wide averages in Brooklyn’s District 19, according to researchers at the UFT. Even so, it received a D on its most recent K-8 School Progress Report, which incorporated the performance of the middle school students in the secondary academy. Student test score results at the elementary academy are affected by its admissions policy: Unlike many other charter schools, neither academy at the UFT Charter School turns away any students, no matter what their needs. The elementary school boasts two teachers in every K-3 classroom and one paraprofessional per grade and caps all classes at 25 students. Photo by Dave Sanders: chool head Sheila Evans-Tranumn (left) with elementary academy PTA President Chester Campbell and elementary academy School Leader Michelle Bodden-White. Teachers also monitor student performance on a weekly basis. “There’s been a tremendous emphasis on assessment’s intersection with instruction, so teachers provide instruction based on assessment,” Bodden-White said. Tutoring is available before school for those students who need it, and the academy has formed partnerships with Fordham University and the YWCA, both of which provide homework help in the afternoons. The academy also has coaches to help educators improve their literacy and math instruction and their implementation of response-to-intervention. Bodden-White also emphasizes the academy’s unique culture and mission, encapsulated in its “crest,” an acronym for community, respect, excellence, scholarship and trustworthiness. That culture is apparent in the academy’s emphasis on democracy and democratic decision-making, with monthly schoolwide “town hall” meetings at which students are recognized for embodying the academy’s core values. Students also elect a student government and choose democracy- or labor-themed names — like the “Strikers” or the “Rockets,” for “the rockets’ red glare” — for their classes at the beginning of the school year. And in May the academy holds its annual Labor Learning Day to teach students about unions. The purpose, according to 1st-grade teacher Maria Soehngen, is to prepare students not only for academic success but also for a lifetime of active participation in a democratic society. “This school is one of the only schools I’ve seen where the staff is dedicated to making students well-rounded, both academically and socially,” she said. The Charter Schools Institute is expected to render its decision on whether to renew the K-12 school’s charter by the end of January.